The Ecology, Biodiversity, and Conservation series presents balanced, comprehensive, up-to-date, and critical reviews of selected topics within the sciences of ecology and conservation biology, both botanical and zoological, and both 'pure' and 'applied'. It is aimed at advanced final-year undergraduates, graduate students, researchers, and university teachers, as well as ecologists and conservationists in industry, government and the voluntary sectors. 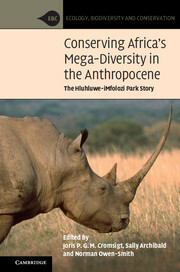 The series encompasses a wide range of approaches and scales (spatial, temporal, and taxonomic), including quantitative, theoretical, population, community, ecosystem, landscape, historical, experimental, behavioural and evolutionary studies. The emphasis is on science related to the real world of plants and animals rather than on purely theoretical abstractions and mathematical models.